As long-time advocates of measures to reduce car travel and increase bike, ped, and transit use, the 14th Street PeopleWay is very exciting. It’s thrilling that it has already gained so much traction. As the primary motivation of the PeopleWay is to help move people who will be hurt by L-Mageddon, buses will need to play a major role in the 14th Street PeopleWay. While the MTA and NYCDOT work out plans for the L train shutdown, we hope these lessons learned the hard way in other cities may provide New York with some useful insights. Bus lanes, and even SBS-style fare collection, will only help so much. Without full BRT, the 14th Street PeopleWay will become a bus parking lot. High bus volumes on 14th Street, even today, cause bus bunching and queues at stops. In classic BRT planning terms, busways are designed around the number of passengers moving in the peak hour, peak direction (PPHPD). A single standard bus-only lane can handle between 4,000 – 6,000 PPHPD. Currently, there are about 2,000 PPHPD on the M14A and M14D westbound from 8 am to 9 am. The buses are currently moving at a glacial 4mph, and they frequently bunch up. Once the L train shuts, they will be joined by approximately 3,500 additional PPHPD from intra-Manhattan L trips with no subway alternative and another 4,500 PPHPD crossing from Brooklyn into Manhattan on the L with destinations along 14th Street. Thus, the potential PPHPD on 14th Street could skyrocket to 10,000, a bus volume all but unknown in the US, and far more than a standard bus-only lane can handle. A bus lane can handle only as many buses as the bottleneck station can accommodate. On 14th Street, this is the bus stop near Irving Place just before Union Square. When buses occupy the most congested bus stop for more than 40% of the time, the bus lane congests and speeds drop sharply. When buses occupy the stop 100% of the time, the busway becomes a parking lot. That’s what’s happened in São Paulo: the Antonio Rosa BRT station, the station with one of the highest boarding volumes on the Rebouças corridor, was rebuilt without considering how to handle the bus volumes, and every morning buses grind to a standstill. Cities with bus corridors carrying similarly high numbers of passengers have learned from the lessons in São Paulo. Major advances have been made in busway design, which can be seen in cities like Rio de Janeiro, Johannesburg, and Seoul. Now that we are facing similar volumes in New York on 14th Street, we need to draw from the strategies other cities have used to create a busway that moves freely. If nobody were getting on or off, each bus would still take about 18 seconds to pull up at the bus stop and open and close its doors. With the roughly 85 buses an hour needed to handle the projected demand on 14th Street, the main bus stops are already occupied 25 minutes out of an hour, so every stop has already reached 40% occupancy; in other words, the busway will already congest, even before we consider the time taken by passengers getting on and off. Provide adequate space for buses at stations. With the bus volumes anticipated on 14th Street, providing one or two bus bays, in most cases, is not enough. If all buses stopped at the same place at a bus stop, that bus stop would quickly become saturated. By splitting the congested bus stops into two separate sub-stops, with two docking bays each, only half the buses need to stop at the first sub-stop and the other half could stop at the second sub-stop. Between each sub-stop, buses would have two places to dock. In this way, four buses at a time can board passengers simultaneously. From our calculations, this is the amount of space needed at the highest ridership station (Irving Place near Union Square). Other stations could probably be shorter with the exact length calculated based on anticipated levels of saturation. After a passing lane was added at a bus stop on the Seoul BRT, buses were able to pull around each other and the previously congested Seoul busway decongested. For these volumes, passing lanes at stations are needed. When a bus finishes boarding and is ready to move on, it can pull around the other buses still stopped at the station. If it can’t do this, more buses queue up and station saturation occurs. Note that we do not need a dual bus lane all the way across 14th Street, as has been suggested in other forums. Since the bottleneck for a busway is always at stations, the passing lane need only be at stations. Further, if stations are offset (meaning one block gets a westbound station, the next block gets the eastbound station), we only need one passing lane on each station block. On blocks without stations, there is more space to reclaim. We’ve developed a conceptual design for a westbound bus stop at Irving Place just before Union Square that would have the capacity to handle all the passengers we expect. Note that the bus stop itself would consume one lane of 14th Street, so that passengers waiting for buses don’t block the sidewalk, and there is still enough room for a bikeway. As there is no room left for mixed traffic on this block, the first block of Irving Place can be transformed into Irving Plaza, since it no longer serves a traffic function: a public space bonus. These design measures are necessary but not sufficient to solve the problem. There is still the delay caused by passengers boarding and alighting. Currently, passengers on the M14A and M14D take, on average, 4.48 seconds to board and 1.45 seconds to alight. It takes much longer to board than to alight because currently passengers have to step into the bus and pay the driver, and boarding passengers can only enter through the front door. Off-board fare collection. If all of the bus routes on 14th Street (M14A, M14D, and any other new routes brought in to mitigate the L Train shutdown) have off-board fare collection like on SBS, the delay per boarding and alighting passenger drops significantly (1.2s and 0.8s per passenger, respectively). MTA and DOT might even consider pre-paid fare zones, like what is being rolled out in Chicago and on most BRTs internationally, rather than “proof-of-purchase” which is the method currently employed on SBS. This would save passengers the anxiety of inspectors demanding tickets, and would avoid the delay that currently happens when inspectors hold the bus while they check everybody’s ticket. However, with off-board fare collection alone, the Irving Place/Union Square station will still congest, so the whole corridor still ultimately grinds to a halt. With at-level boarding in addition to the above three measures, delay drops yet again. This is because it takes a lot less time for elderly passengers, passengers in wheelchairs, passengers with children in strollers, shopping carts, or luggage to enter the bus at-level. At-level boarding is increasingly widespread in BRT systems in the US, including in Cleveland, Eugene, San Bernardino, Hartford/New Britain, and Grand Rapids. With these core features, 14th Street could accommodate most of the displaced L train passengers – as well as those riding the M14 buses – that would still need to travel within this corridor. In this way, the 14th Street PeopleWay, in addition to reclaiming 14th Street from cars, can become, within Manhattan, a genuine alternative to the L during L-Mageddon and beyond. The L Train Closure: Who Gets Screwed? Who is most affected by the L train closure and what should be done? The 2019 closure of the L train threatens to devastate the trips of up to 200,000 New York City commuters every day. Many possible solutions have been floated to mitigate the dramatic impacts of closing this key link in New York City’s transportation system. Shortly after the original announcement, we developed a few preliminary ideas which we wrote up on Streetsblog. Now, as the L train shutdown moves closer to reality and government response is lagging, we are taking a deeper look at the problem. Some solutions, particularly those that require some construction, need to go into detailed design immediately if they are to be ready in time. To best provide alternatives to L train passengers, we took a look at which of today’s L train trips will be most affected by the closure. We created a matrix of many of the popular origins and destinations in Brooklyn and Manhattan, including between many of the L train stops, and calculated the shortest existing peak hour (8am – 9am) travel times, using the L where appropriate. We then created a second matrix showing the travel times between the same origins and destinations, but as if L train stations from Bedford to 8th Avenue were closed. We assumed no changes to the transit network as none have officially been announced. Also, we did not assume slower speeds which would inevitably result from overloaded buses and trains. This would make the picture even worse. The resulting matrix shows the increase in travel times for each origin and destination under the L train closure scenario. This shows that the most affected trips will be those headed from all Brooklyn L train stops to 1st Avenue and 14th Street on the east side of Manhattan. This is because there are few ways to get to 1st Avenue and 14th Street besides the L train. The stations furthest from M train connections are the most adversely impacted. Passengers from Graham Avenue to most Manhattan destinations are hurt the worst, since Graham is the furthest from any M train connections: as you move further out on the L train, you get closer to Myrtle-Wyckoff Station where there is a direct connection to the M train or to Broadway Junction where you can take the A/C; closer in (Bedford or Lorimer) and you can walk – albeit a long distance – to Marcy or Hewes. Trips into Union Square are less impacted than trips to the east side but equally, if not more, important due to the higher volumes of passengers headed directly into Union Square. We are still working on a matrix which shows passenger volumes between each origin and destination but we know intuitively (and from observation) that more people go from Brooklyn to Union Square than from Brooklyn to 1st Avenue. Interestingly, the above matrix also shows that many trips within Manhattan will not necessarily be affected. Those going from the far east side (e.g., 1st Avenue) to the far west side will lose up to 14 minutes per trip and that is obviously not negligible. But only these extreme cases will experience more extreme (but comparably not as bad) travel time increases, and these short flat trips are the most easily replaced by bike trips. We created another graphic showing the various modes current L train riders would need to take to get between stations by transit. New trips (shortest path) to/from L Train stations. In many cases, significant walking times (between 8-17 minutes) will become part of the trips: a considerable hardship for senior citizens and people with disabilities. Again, this shows that passengers to 1st Avenue and Union Square will be hurt the worst. J/M trains: Probably most important since many of the trips will shift to the J and M as the next closest direct route into Manhattan. G train: Because the G Train connects some of the affected population to several lines that run directly into Manhattan, MTA should increase frequency on the G. Adding cars to the G will increase capacity but generally won’t decrease travel time for impacted passengers. Adding frequency will both increase capacity and decrease travel time. Though it has operating cost implications, added frequency on the G should be considered as an L train mitigation measure. More cars and more frequency would be even better. L train: Many passengers will still use the L to connect to the J, M, A, C, and G, some of them headed outbound in order to go back inbound. While a high frequency on the L may not be warranted from a demand perspective, the current frequency should be maintained as a mitigation measure since most of its passengers are already being greatly inconvenienced by the closure. The longer they have to wait for an L Train that will take them to their connecting train, the longer their already-long trip will become. G and Manhattan-bound F at Bergen St.
3. Ferry services may be increased but are not a panacea. They help only the people near the Williamsburg and Greenpoint ferry terminals traveling to East 34th Street (and potentially E. 20th St). However, expanding bicycle access to and on the ferries would help broaden their catchment areas. 4. Citibike and bike parking should be expanded at all key subway stations and the bike network should be upgraded, especially to serve the most impacted trips. 5. 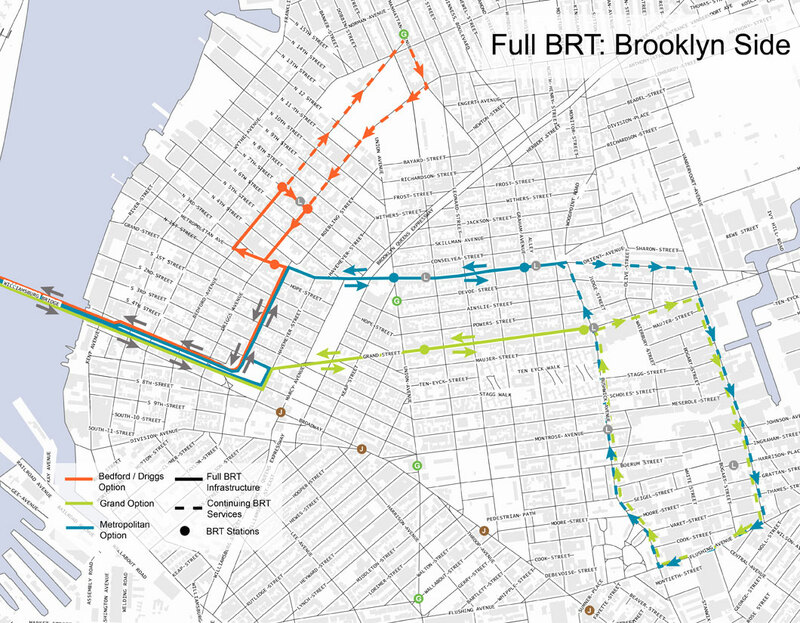 NYCDOT should build full BRT (not shuttle buses) to serve trips that are extremely impacted. Shuttle buses that take people to subway stations would back up on already congested streets and would represent another leg in an already multi-legged trip. Most people wouldn’t take them. Bus lanes or HOV lanes on the Williamsburg Bridge and through the Midtown Tunnel, with direct bus services between Brooklyn and Manhattan, would help. However, dedicated bus lanes need to continue into Brooklyn and Manhattan as congestion is not limited to the bridges and all BRT measures need to be included or we will face long queues of buses. We have developed several BRT concepts to go along with this final recommendation and will publish them in an upcoming post. In the past few years, in response to falling bus ridership, a string of cities have been considering a full restructuring of their bus networks. Many cities have bus networks that haven’t been changed for years, and over time have ossified into patterns that no longer optimally serve their residents. The prevailing wisdom in the US transit community is that bus services are spread too thinly, in an attempt to accommodate residents from high density and low density neighborhoods equally. Indeed, there is political pressure in many communities to serve everyone equally, regardless of where they live. And yet, by providing too much equality of service, transit agencies are selling short the denser clutches of riders who could benefit from more service. The bus network restructurings that are taking place across the country, thus seek to address this fundamental problem. And yet, there is no clear technical toolkit for doing so. The closest we have seen is the book by Jarrett Walker, entitled Human Transit, and follow-up blog posts and additional work he has done on the subject. However, some key elements of his approach have not been subjected to sufficient scrutiny, which we will address in further posts. Beyond that, there is no technical guide, no documentation on how one might go about restructuring a bus network, or a set of diagnostics that indicate when there is a problem with the existing bus network. Like BRT, bus network restructuring, if done right, could have the power to bring riders back to transit, better serve transit dependents, and revitalize the bus mode which still accounts for the majority of transit trips in the US. A well-done bus network restructuring could even lay the groundwork for a new BRT network. But as we have also seen with BRT, the concept alone is not enough to produce these fundamental changes. If done incorrectly, in fact, it could have the exact opposite effect of what was intended: existing riders could see their commutes get much longer and drivers will simply stay in their cars. Also like BRT, bus network restructuring is becoming highly politicized. In the US, where even simple changes like the removal of unnecessary bus stops has proven a challenge, major changes to a bus network may not survive the community process, and may devolve into something incoherent and worse than before. Our sense is that this is already happening. Transportation trends come and go. Some, like congestion charging, have been smart but so politically challenging that they have not really caught on. Others, like urban cable cars, were ill-conceived and probably shouldn’t have gotten as far as they did. Bus network restructuring seems like a sensible emerging trend with good potential. But if this trend is to survive, we will need to figure out how to do it well. The following series of blog posts will address some of the technical challenges emerging as part of this trend, with some proposals on how to overcome them, and several of the political obstacles which are already beginning to arise. The news that Sandy-related repairs will require closing one or both directions of the L train under the East River (the “Canarsie Tube”) for one to three years has understandably caused panic among the estimated 230,000 daily passengers who rely on it. Businesses in Williamsburg that count on customers from Manhattan are also concerned about a significant downturn in sales. When the Canarsie Tube was shut down on weekends only last spring, it was bad enough for their bottom line, and this will be much worse. Fixing the Canarsie Tube is imperative, but it doesn’t have to result in a massive disruption that threatens people’s livelihoods. The key to keeping L train passengers moving is to create new, high-capacity bus rapid transit on the streets. Since the potential closure went public, several ideas have been floated to mitigate the impact. None of them do enough to provide viable transit options for L train riders. Only setting aside street space for high-capacity BRT can give riders a good substitute for the train. This can be done in time for the impending subway closure while also creating long-term improvements that address surface transit needs in northern Brooklyn much better than a waterfront streetcar ever could. While some L passengers will be able to switch to other subway lines, a huge number will face significant inconveniences. Passengers from Bedford Avenue to Union Square, for example, will face up to three new transfers. For these passengers, a few ideas have been suggested: The MTA could provide shuttle buses to the J/M/Z, as was done during last year’s temporary closing. Or there could be shuttle buses over the Williamsburg Bridge, perhaps in dedicated lanes. Providing enough shuttle buses to serve such a massive number of people is a grim prospect. The shuttle to the J/M/Z last spring was very inconvenient, and even if there were a shuttle with dedicated bus lanes over the Williamsburg Bridge, the streets between the L train and the bridge will still be jammed with slow-moving buses. Upwards of a hundred thousand daily passengers who used to zip between northern Brooklyn and Manhattan will suddenly face a chaotic transfer and a torturous bus ride. Many commuters who have the option of driving will simply get into their cars. The closure of the Canarsie Tube could be addressed by a temporary solution, but the problems on the L are not temporary. Sandy is unlikely to be the last major storm to damage our tunnels. And as more and more development comes online, the crush loads on the L will get worse and some people will start opting to drive. Indeed, before the big L train news, the developers at Two Trees were already looking into a Brooklyn-Queens waterfront streetcar to provide additional transit access for the massive influx of residents and jobs. That proposed streetcar would travel up and down the waterfront at speeds slower than the existing B32 bus, which carries only 600 daily passengers. It wouldn’t provide a connection into Manhattan where far more people want to go. The city and the MTA can address the L train closure and the transit access problems by the Brooklyn waterfront at the same time by building world-class bus rapid transit. This BRT solution would go beyond what New York has done so far with Select Bus Service (SBS), which brought benefits mostly through off-board fare collection. The SBS toolkit will not be sufficient to handle the huge number of stranded L train riders. To move all those passengers without creating a busjam, the full arsenal of BRT elements needs to be deployed: a fully dedicated busway that can’t be impeded by deliveries or drivers turning right, stations level with the bus floor, off-board fare collection, and more. Connect to L Train stations via fully dedicated BRT lanes. While a specific routing needs further study, a bike/ped/transit mall down Bedford, perhaps as a one-way pair with Driggs, is appealing. Bedford is already overflowing with pedestrians who could use more space, and when closed to traffic for Williamsburg Walks on three Saturdays each year, it has experienced few problems. Because Williamsburg in that area is a grid, there are several good alternatives for diverting traffic. One landmark station with off-board fare collection, and a free transfer to the L (ideally a physical connection so all those passengers are not double-swiping), could be built at Bedford and North 7th (and Driggs in the other direction) with another station at Metropolitan to avoid overcrowding and to shorten the walk for many passengers coming from the waterfront. Maybe the community can stomach sacrificing a few hundred parking spaces to improve the daily trips of 230,000 former L train passengers. 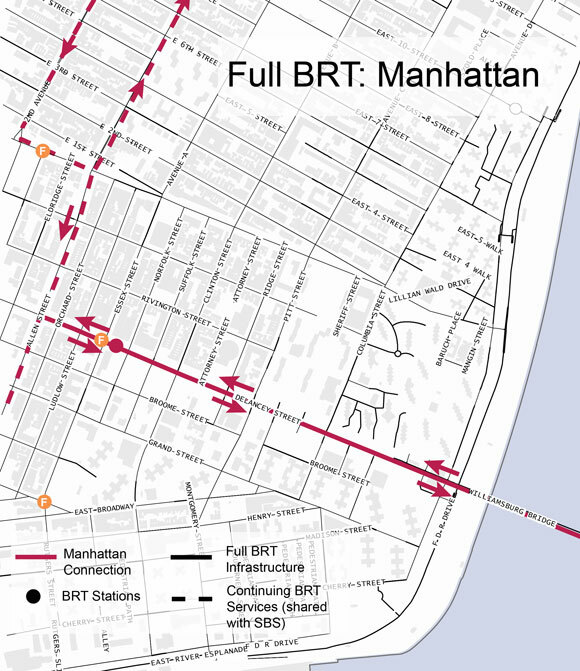 Full BRT might also be considered along Metropolitan Ave to connect both the Lorimer and Graham L stations to the bridge access routes, or on Grand Street, providing a straight shot from the Grand St. L stop onto the Williamsburg Bridge. Trucking would be restricted to the arterial that did not have BRT. Brooklyn connection to the Williamsburg Bridge. In the short term, BRT vehicles could access the bridge from a dedicated busway on a short section of Roebling (between Metropolitan and the bridge) or Borinquen, depending on how the busway connects to the L, and would exit the bridge (also on the Brooklyn side) into the existing terminal at the foot of the bridge. In the long term, dedicated access ramps to the center lanes of the Williamsburg Bridge would be needed to fully bypass the bottleneck. Connect to Delancey/Essex Station and Allen Street SBS. On the Manhattan side, BRT vehicles would run on a central median-aligned busway on Delancey with a station at Essex to connect to the Delancey/Essex Street F/J/M/Z trains. Many passengers would transfer into the subway system there. But it would be a missed opportunity to not continue the busway to Allen Street and provide direct connections into the M15 SBS which operates two-ways on Allen Street. Some buses could make the turn and continue north (up First Avenue) or south (to the Financial District) while others may turn around and head back to Brooklyn. In Brooklyn, extend the Bedford service to the Nassau G. With BRT, even when the dedicated lanes end, the services can continue. Ideally, a dedicated busway on Bedford could be extended north to the Nassau Avenue G station. Even better, the full bike/ped/transitway could be extended like this. But even with the L train East River closure, we cannot expect taking road space to be a snap. At the very least, we should extend the BRT service to the north in mixed traffic, beyond the Bedford L station, to the Nassau G Station. This will cut out the need for the one-stop transfer from the G to the new BRT route and will speed up the trips of many people who currently rely on the G. This benefit will also outlast the Canarsie Tube closure. Only true BRT has the capacity to carry the 230,000 daily trips the East River L train tunnel currently handlesand be built in the timeframe we are talking about. If designed right, BRT could make the trip significantly faster than the multiple-transfer subway alternatives. The proposal could also help address the growing transit needs of the Brooklyn waterfront, most of which are Manhattan-bound rather than Red Hook-bound. It would provide a new, long-term alternative to the L’s 14th Street routing, helping to address the overcrowding problem. The closure of the Canarsie Tube could actually be a once-in-a-lifetime opportunity for New York City to grab some street space and build high-quality surface transit. Walter Hook and Annie Weinstock are principals of BRT Planning International, a boutique WBE planning firm that specializes in BRT projects around the world.